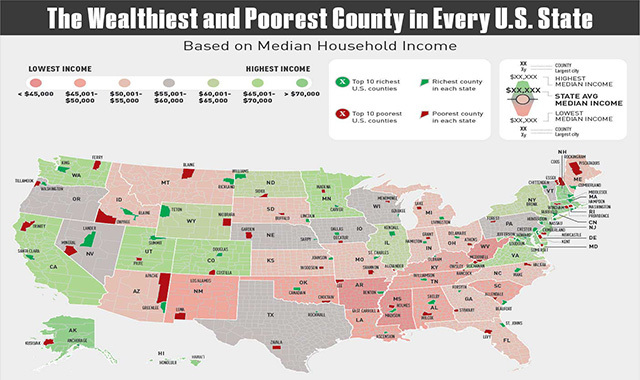 The Richest and Poorest County by State #infographic ~ Visualistan '+g+"
Which counties across America are the richest? Loudoun, Virginia takes claim as being the wealthiest county in the United States, with an average household income of $134,600. This infographic looks at the wealthiest and poorest counties in every U.S. state, all based on the median household income. The data is pretty surprising too! Several states show huge disparities too, including Virginia, New Mexico, Colorado, Maryland, Tennessee, Georgia, and California. In New Mexico, for example, the median household income is $114,700, whereas in Luna County, it's much lower at an average of $28,200. Another example would be in Colorado, where Douglas County has a median household income of $112,400, while Costilla's average sits at $27,200. Based on the data, the poorest county in the entire country would be Holmes County in Mississippi, which shows a median household income of only $22,000. Mississippi's richest, on the other hand, would be Madison County, where the average is $65,900. Where's your county fall?